This is part of a blog series intended to document and define learning at Elk Grove High School throughout the 2018-2019 school year in order to increase student learning, give professionals autonomy, increase trust in our learning community, and foster a sense of personal-intellectual collegiality within the building across departments. You can read all of the previous posts here. I'm blown away by the student reflections this week. They write to what they want for their future. They write about how they learn best. They are honest. They know themselves. I wish I was this clear in my vision when I was in high school. The course itself is really helping me learn more about my interest and my capabilities as a student. By learning more about the careers I also hope that I can figure out more about myself. Being able to do activities and take notes all in the interactive journal has been one of my favorite additions to my learning method. Mrs. Glosson had taught us how to study these new topics on ourselves. I’m interested in learning more and finding out more about the medical career and what it has to offer. What did you learn in this lesson? In the first couple of units of Introduction to Health Careers, I have learned a variety of terms along with examples of words used in the medical field of work. 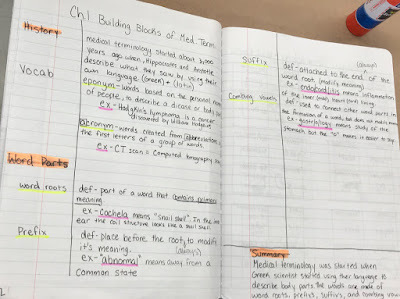 During the first unit (chapter) “Building Blocks of Medical Terminology” I learned that the Latin and Greek language is where many of the terms used in medicine come from. I also learned the basic skill of note taking during unit one because Mrs. Glosson had the whole class take notes all the same, specific, way which really helped me stay organized, and made studying for the quiz much easier. I can now use this note-taking strategy to be more organized in the other class in the future. Honestly, in the beginning, it seemed like there was lots of note taking about prefixes, suffixes, and word root, which made the class feel pretty slow and I just didn’t think it would be a class I would enjoy the whole year. Then we got into unit two “The Human Body” which is when we started to learn about not only what makes up the body, such as atoms, tissues, organs, etc., but then I got to personally learn something new which was the regions of our body. 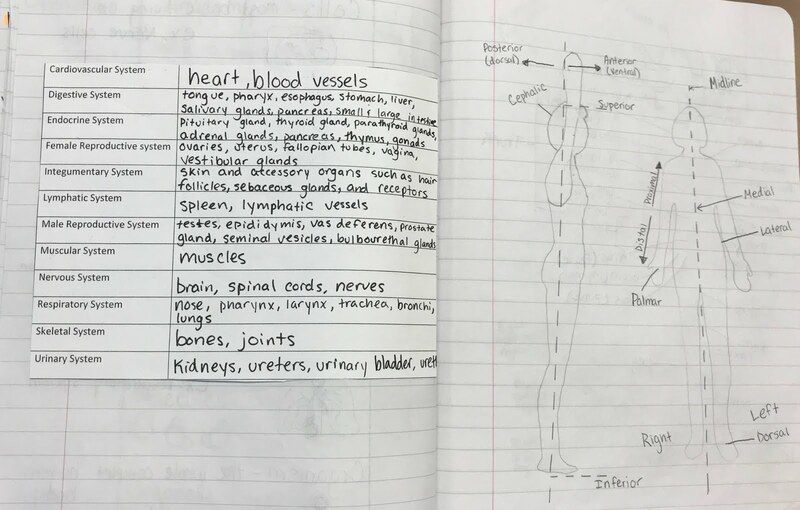 My art skills were put to the test during the notes in this particular unit because we have to draw some bodies in our notebooks and then label them based on where the regions are located. At first, when doing this it seemed like they would be no help and really confusing to study however this wasn’t the case at all. The pictures helped me visualize them on myself and others where the regions are located rather than them just being listed as bullet points in my notebook. So far this year in Introduction to Health Careers I’m not really sure if going into health care is still what I want to do, yet the course itself is really helping me learn more about my interest and my capabilities as a student. What do you hope to learn for the next time? For next time I hope to learn more about the specific jobs of different medical careers and the amount of post-high school education some of them require. By learning more about the careers I also hope that I can figure out more about myself. I want to learn more about my interests because all I really have to base my interests off of is what I’ve seen on tv and in movies. I think that if I learn more about different jobs then I can figure out a plan on which class to take later in high school. Since the start of the school year, I have learned some of the basic vocabulary and skills in health care. We have started learning word structure and word construction in medical terminology. This process has been effective so far because of the organization of all of our work in our notebooks. In both this class and AP Bio, organizing our work with the notebook has been an effective form of not only the organization but also as a study tool. Being able to do activities and take notes all in the interactive journal has been one of my favorite additions to my learning methods and has assisted me greatly in learning the material in the class so far. Throughout the year, I want to learn in this class the specific healthcare jobs to see if this field fits me. In these units I have learned many new things like in unit one I learned lots about the medical terms that come from greek and latin words, as well I have learned about many of the meanings behind these words and their prefixes, suffixes, combining vowels, and root words; Which are commonly and will always be used in the medical field. I also learned many new ways to organize my notes. In a way where I’ll be able to always add on if needed. These new ways to organize notes has helped me find a way to study faster it also is easier to the eyes instead of just reading bundles of paragraphs stacked on top of each other. 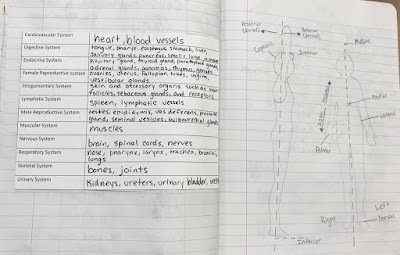 In unit two we learned about new prefixes, suffixes, combining vowels and root words; but other than that we learned about body regions and it’s placement along with how the body is made up. Here Mrs. Glosson had taught us how to study these new topics on ourselves which has been really helpful considering I don’t need to worry about reading books or study pages of notes. We also had to do at one point in the Unit make play-doh people which were fun and also very helpful especially with having to label them. Which is a plus for me because I learn better visual then oral or writing methods. All in all, I’m still confused about what I truly do want to do for my future but for now, I’m interested in learning more and finding out more about the medical career and what it has to offer. This class, however, has helped me keep organized in my other classes and also has helped me figure out my strengths and weakness as a student in high school and what I am really interested in. Curriculum - Why do we have to get through it?